The Japanese conquest of the Pacific comprised of a complex series of widely scattered operations; their intent was to neutralize American, Commonwealth, and Dutch forces, seize regions rich in economic resources, and secure an outer defense line for their empire. Although their conquest was successful, the forces deployed from Japan and China were not always ideally trained, equipped and armed. The South Seas and tropics proved challenging to these soldiers who were used to milder climates, and they were a less lethal enemy on the Chinese mainland. 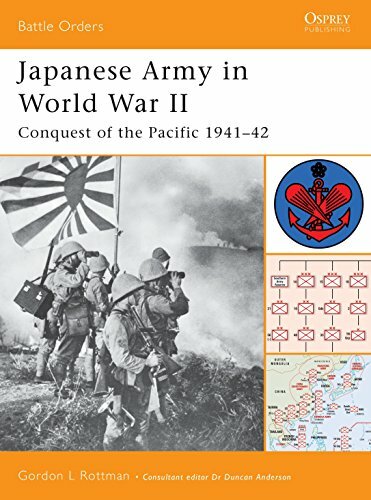 This book examines the overall structure of the Imperial Japanese Army (IJA), the forces in existence at the beginning of World War II and the organization of the forces committed to the conquest of the Pacific. Definitive guides to the actions and evolution of fighting forces, these comprehensive studies on the organisation, strength, command, deployment and evolution of forces in key military encounters, use a highly detailed 'unit-by-unit' examination. Retail sales for used and antiquarian books. INCLUDE THE BOOKSELLER INVENTORY/CATALOG NUMBER OF THE TITLE(S) IN QUESTION IN ANY CORRESPONDENCE. PLEASE DO NOT SEND CHECKS OR MONEY ORDERS WITHOUT PRIOR CONFIRMATION OF THE BOOK"S AVAILABILITY. DO NOT SEND CHECKS OR MONEY ORDERS WITHOUT REFERENCE TO THE COMPLETE TITLE & CATALOG#. International customers are responsible for all Duties/Taxes/VATs/etc. For international shipping, there is really only one method now, Air. So we state one price. We shall gladly reduce your shipping charge if the cost is less than our quoted rate; likewise, if your package costs significantly more, we'll request that you pay an additional amount.